Ingredients: Coconut oil, Cannabis oil, Gelatine Capsule. Purchasing this product will earn you 150 Greenbucks! 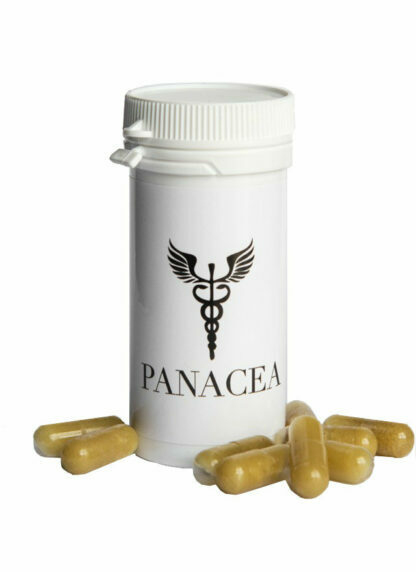 Panacea Cannabis Oil Capsules are a high-quality medical-grade cannabis oil that contains a 1:1 CBD/THC blend that has potent medicinal and therapeutic effects for many conditions. Panacea cannabis oil at the recommended dosage lacks the psychoactive effect commonly associated with a marijuana high. Each Panacea Cannabis Oil Capsule contains 200mg of cannabis oil, as recommended for cancer patients and those in severe pain. For reference, each Panacea Cannabis Oil Capsule is equivalent to approximately 25 drops of the Panacea Cannabis Oil Tincture. Coconut oil, Cannabis oil, Gelatine Capsule. Cancer: 5 drops tincture three times daily and a capsule at night. Advanced cancer: 10 drops tincture three times daily and a capsule at night. Parkinson’s/Dementia/Alzheimer’s/Severe Pain, Depression, Stress or Anxiety: One capsule as needed up to 3 times a day.